***Updated 7/18/2017: Sadly, I cannot continue to recommend this app. If you purchased this app, do NOT update it. The makers of this app have moved to a subscription based app called Speech Blubs, and this app, First Blubs will no longer update correctly. They currently have a price of $99.99 on the First Blubs app in order to force people over to their newer Speech Blubs app. If you own it, enjoy it, but DO NOT update it at the app store. You will lose all of your animal sounds. The newer app offers a free short trial, however, after that, you will be charged a $9.99 a month subscription fee to use Speech Blubs. I in no way endorse the Speech Blubs app. I have not reviewed any copy of the Speech Blubs app. The app developer is misusing my name as well as several other SLP blogs in order to promote their new app. I have requested that they remove the My Speech Universe name from their app descriptions on all platforms (Apple, Google Play, Amazon) as well as from their website or any other social media. 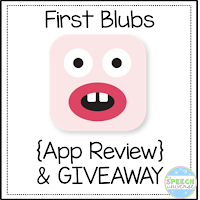 I was offered an opportunity to review a cute app by Blub Blub apps, and want to share it with you and give you an opportunity to WIN ONE of TWO COPIES! Disclaimer: I was provided with a copy of this app to review. The opinions expressed are purely my own. The apps in the giveaway will be provided by Blub Blub. 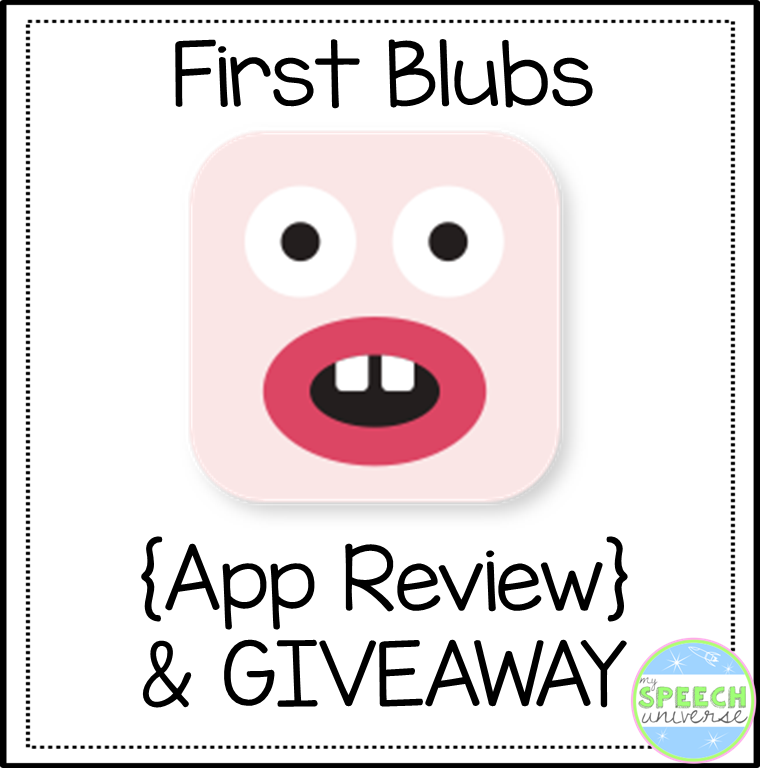 First Blubs is a cute app targeted towards toddlers and late talkers. The suggested age is under 5, however, I used it with a student who is seven years old and non-verbal, and he fully enjoyed it! This app is available for both iPad and iPhone. The concept of this app is simple. Students are encouraged to imitate videos of other children making animal sounds. There are a variety of animals to choose from. You choose the animal that you would like your student to imitate (there are 22 different animals), and it shows you a video of students making the animal sound. In the upper right corner, there is a small circle that shows the student on video so that they can see themselves make the sound with the other child. You can click the small circle and flip the video so that your student is the large video. This option gives you different props within the video to make it fun. I used myself in this example to protect the identity of my student. The student I used this with loved it! He started imitating right away which shocked me! He typically does not imitate any sounds or movements. This particular video does not have any voicing which I think made this easier for him. Other animal sounds do have voicing that your students can imitate. When the student watches the video for a certain amount of time, they earn an icon at the bottom left of the screen. When clicked, this will take students to a video of either a fact about the animal or a fun video using the children featured in the app. What I liked about this app: It was very engaging for my student. I don't have a lot of young students on my caseload, however, I feel that this would be very engaging for very young talkers. It would be great for a quick warm-up activity. What I would change about this app: Nothing! It is a cute app that does exactly what it says it will. It engages students to imitate animal sounds. First Blubs is a free app that gives you three animals to try out. You can purchase the remaining 19 animals for $6.99. This is so cool! I am in love with the app since you I read your review and downloaded! My nephew has a fun time on the app and has managed to learn quite a few animal sounds. Thank you for the review.